Everyone loves a bake sale. Not only is it a beneficial way for schools, religious groups and other non-profits to raise money for a cause but it is also a way to encourage community involvement and sample some delicious treats. However, a bake sale with no advertising is likely to be a significant disappointment. This bake sale poster is sure to catch the eyes of hungry patrons. 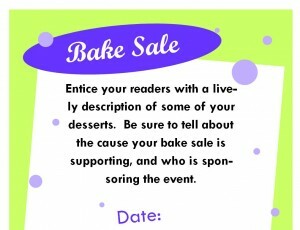 The template for the bake sale poster is bright in color and leaves plenty of space for customized information including the date and time as well as the contact information and location of the event. There is even an image of a tasty pie to get everyone’s taste buds excited. Below are steps detailing how to use this template as well as some tips for a successful bake sale. First, download the template completely free right from this site. Next, open it up in Microsoft Publisher and you are ready to customize. This bake sale poster makes it really easy to include all the relevant details. It is important to fill in the blanks about the time, place, date, and contact information. There is also a large spot in the center where you can add additional information such as the purpose of the fundraiser and the types of desserts. Finally, simply print out the posters and distribute them to friends, family, co-workers, and those involved with the bake sale in order to spread the word about the event. When advertising for the bake sale, be sure to understand who your customers might be and place posters in locations where they will be seen. For instance, if you are doing a school bake sale then send the posters home to parents. Be sure to have plenty of donations to sell at the bake sale and think outside the box. Try also selling coffee along with the baked goods for example. Try to recruit people who enjoy baking because they will likely be happy to donate plenty of baked goods. Make sure that you are prepared on the day of the bake sale with plenty of volunteers to run the event as well as a well-organized, neat, and clean presentation with table cloths, napkins, and other décor to attract those who may be passing by.